This page contains links to around thirty stories about my great-great-grandparents. They are not my stories, but come from my four grandparents. They are their stories about their grandparents. If they are not wholly accurate then it is because I have carried them in my head for nearly fifty years. In addition, what is a story without some embellishment? My grandparents belonged to an era in Scotland when radio, television and the modern media had not yet submerged the age-old habit of story-telling. I have fictionalised the stories, but then buttressed each with modern research, including the scanning in of supporting documents. It is for you to decide what is real and what is not. They start with a one page introduction, and a couple of small family trees which show who these people were in relation to my parents. If you just want the stories, then feel free to jump this section. The first group of six stories concern John McLaren Adamson (1808-1869) and his wife Jean Bell (1822-1905). John was first a coal miner in Fife, then a Royal Marine for 23 years, serving all round the world (1833-1856), and then again a Scottish coal miner. Jean Bell was a farm servant before marriage, and then a washer-woman when widowed. The stories were told to me by grandmother because my grandfather, also John McLaren Adamson (1886-1962) died when I was only five. These were his grandparents. However, she was a world-class story-teller, and although somewhat embellished in the telling, they turned out to have the essence of truth when I researched the facts forty years later. The next group of four stories concern James Hunter (1834-1910) and Margaret Petrie (1832-1913). 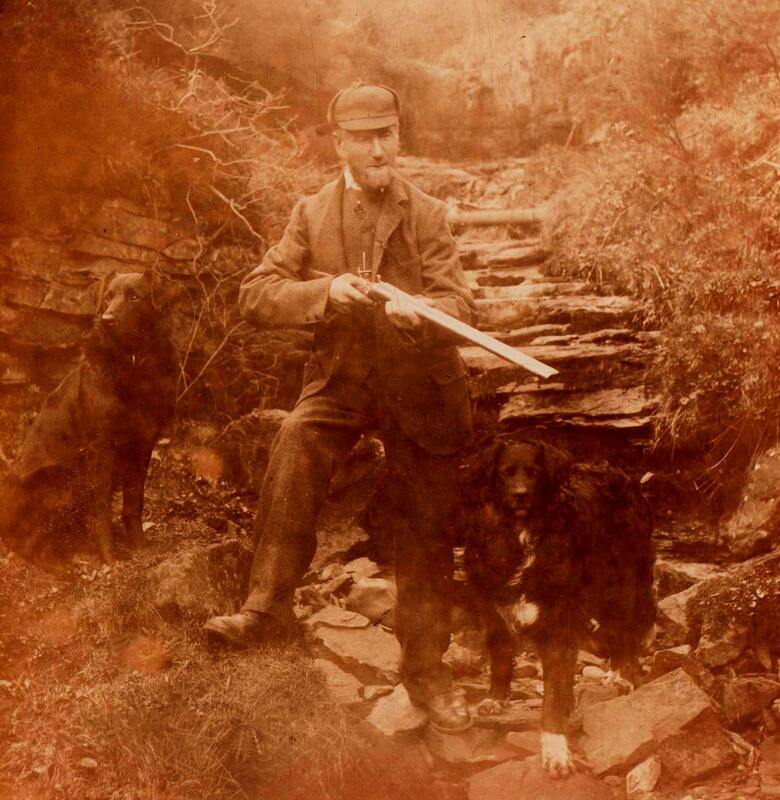 James was a farm servant, shepherd and game-keeper. He was born in Tullibody, Clackmannanshire. He worked for farms and estates in that county and the adjacent West Fife. For the last twenty-five years of his life he worked for the Wallace family at Halbeath outside Dunfermline. Margaret worked as a domestic servant before marriage. Once again the source of these stories was my grandmother, rather than my grandfather. She knew the Hunters well, especially as her widowed mother-in-law, Christina or Kirsty Adamson nee Hunter (James and Margaret’s oldest daughter) lived with her and her huband and family between 1930 and 1939 in Halbeath. These are two stories concerning my grandmother’s maternal grandparents, Robert Wilson (1841-1910) and his wife Janet Brown (1845-1915). Robert was the son of a Linlithgow joiner, and became a coal miner just over the Stirlingshire border at Muiravonside where he was born. Janet was born in Falkirk. These three stories relate to my grandfather Thomson’s paternal line. The Thomsons came from Dumfriesshire where James Thomson’s (1824-1887) family had a shop in Torthorwald. His wife, Agnes (Nancy) Carruthers (1827-1910) came from a farming background in the same area. They came to Edinburgh after marriage when James got a job as one of the Earl of Rosebery’s of coachmen at Dalmeny House. In later life he was both an ostler in St Andrews and an Edinburgh horse-drawn cabbie. The story of the broken engagement and violent assault came from my grandfather’s sister, Laura, who like him lived well into her eighties. Grandfather “Pop” Thomson lived with my father and mother and me for the last twelve years of his life. I hope to tell some of his tales of the First World War at a later date. 3. Life in the Leith Links “Colonies”: the old age of Agnes Carruthers. The Jermans were Welsh, and the only ones among my 16 great-great-grandparents not to be resident in Scotland. It was their daughter, Sarah, who came to Edinburgh. Thomas Jacks Jerman (1824-1891) and his distant cousin, Anne Jerman (1829-1865) came from a farming family who owned and leased many farms around Llanidloes in Montgomeryshire. Thomas was a younger son, and never established himself on sufficient land to avoid bankruptcy. He then went to Lampeter in Cardiganshire to become a porter at the new railway station. His wife died shortly after he arrived there and left him with a young family. In due course he became increasingly deaf, anddied as a result of a railway accident. My great-grandmother continued to visit Wales until after the First World War, and my grandfather recalled very long Sundays in chapel listening to lengthy sermons in Welsh. William Beck (1843-1912) was born in Musselburgh, became a house-painter in Edinburgh and then moved to the Clydeside to be a ship’s painter. His wife, Janet Sutherland (1843-1928) lost both her parents at an early age and worked in service as a very young girl. They moved around Britain as contracts were offered, and in fact Janet died at Ryde on the Isle of Wight where one of her daughters had married a shop-keeper. James Harrison White (1848-1913) was a protestant Irish immigrant to Glasgow from Cavan Town, County Cavan. He had been educated for the Ministery, at the expense of two maiden aunts, but decided to become an engineer on the Clyde instead. He married a young widow, Mary Bowie (1844-1932), shortly after arriving in Glasgow. Her first husband had died of TB. This article was posted in An Ordinary Scottish Family, Family History Archive, Pre 1914 Photographs and Documents. Bookmark the permalink. Follow comments with the RSS feed for this post. Both comments and trackbacks are closed.